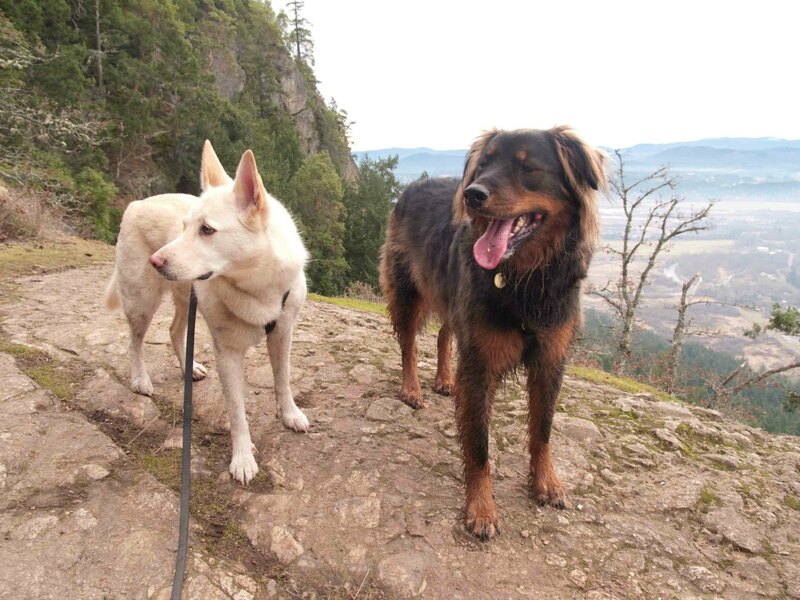 There are many great places in the Cowichan Valley near Duncan to take your dogs hiking. Here are a few suggestions for places that offer good hiking, a good workout for you and your dogs and no vehicle traffic to endanger your dogs. 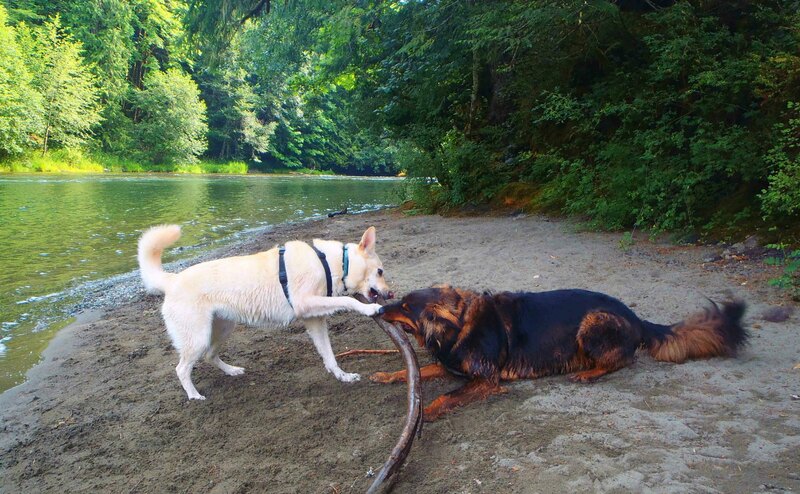 MacAdam Park is a popular City of Duncan park along the Cowichan River which is an off-leash area for dogs. It is an easy walk along flat ground. There is a dike along the Cowichan River in MacAdam Park and the top of the dike is a flat, gravel walking trail. Parking is available off McKinstry Road. See our digital map above. 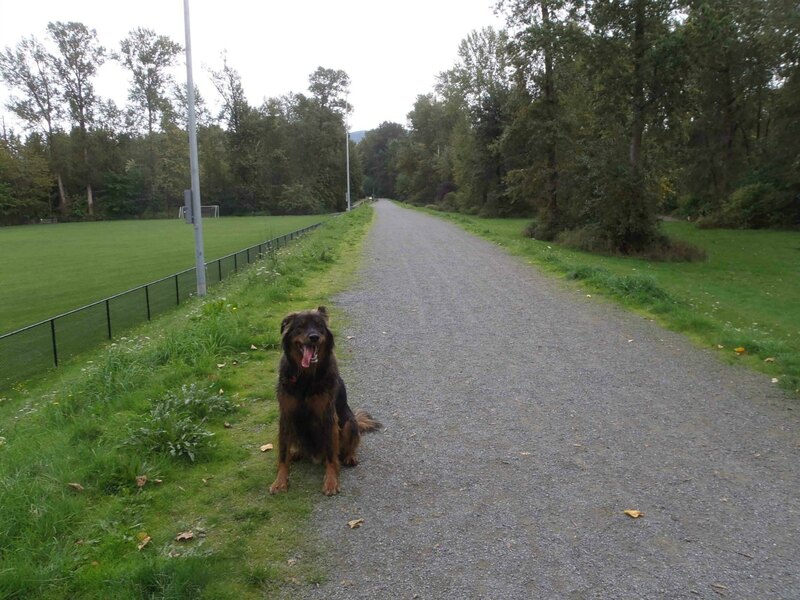 Our dog Buck on the dike in MacAdam Park. Mt. Tzouhalem is a small mountain east of Duncan – and readily visible from downtown Duncan – which offers excellent hiking and great views of the Cowichan Valley. One caution though: there are steep sections and we advise a reasonable physical fitness level for anyone hiking Mt. Tzouhalem. Our dogs, Emma and Buck, on Mt. Tzouhalem. Be sure to carry water for yourself and for your dogs while hiking Mt. Tzouhalem, particularly in the summer. How to get there: you can access the Mt. Tzouhalem hiking trails from Tzouhalem Road (on the south side of Mt. Tzouhalem) or from Maple Bay Road (on the north side of Mt. Tzouhalem). From downtown Duncan, drive east on Trunk Road, at the Lakes Road intersection continue east (straight) on Tzouhalem Road to a traffic circle at Maple Bay Road. For Tzouhalem Road, go straight across the traffic circle and continue down Tzouhalem Road until you find the Catholic Church and cemetery on the left. The Mt. Tzouhalem trail starts beside the Catholic Church and there is roadside parking near the trail head. One drawback to starting at this location is the limited parking available. For Maple Bay Road, go 3/4 around the traffic circle at Tzouhalem Road and continue along Maple Bay Road to Kingview Road. Turn right on Kingview Road, right on Chippewa Road and left on Kapsa Road. At the end of Kapsa Road you’ll find a road leading to the Mt. Tzouhalem parking lot. This is great hike, particularly in the summer because the dogs can go into the river to drink and to cool down. There are also level areas for older dogs and for people whose fitness level may not allow strenuous physical activity. How to get there: from downtown Duncan, drive south on Allenby Road, over the Cowichan River bridge to a four way stop sign. Continue straight across the intersection and up the hill to Indian Road. Continue along Indian Road to a four way stop at Glenora Road. Turn right on Glenora Road, turn right on Vaux Road and follow Vaux Road to the Cowichan Fish and Game Club on Robertson Road. The Glenora Trailhead starts there. There are two parking lots available. We recommend the parking lot near the Cowichan Fish & Game Club because it is shaded by trees. Here the Google Maps view of our recommended parking spot by the Cowichan Fish & Game Club on Robertson Road. One caution though: the salmon come up the Cowichan River in late October and early November. If you don’t want your dogs rolling in dead salmon, avoid the Cowichan River section of Glenora in late October and November. But the Trans-Canada Trail near the Glenora Trailhead is far enough away from the Cowichan River to reduce the potential for dead salmon encounters. 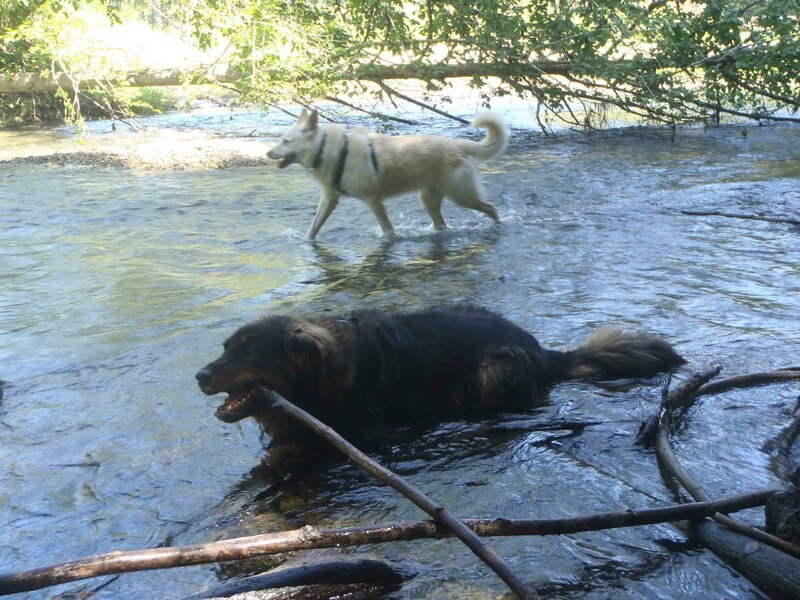 Our dogs, Emma and Buck, in the Cowichan River near Glenora Trailhead, cooling down on a hot summer day. The Kinsol Trestle is one of the highest wooden railway trestles in the world. It spans the Koksilah River and stands 44m (144 feet) high and 188m (617 feet) in length. The Kinsol Trestle was started in 1911 and completed in 1920 This rail line became known as “the Galloping Goose”. It was used until 1979, when the line was closed by by Canadian National Railway. The former railway right of way has since been converted into a hiking trail known as the Trans-Canada Trail. Option 1 – on the Trans-Canada Highway, get to the traffic light at Mill Bay/Shawnigan Lake Road and turn west onto Mill Bay/Shawnigan Lake Road (that’s a left turn if you’re coming north from Victoria and a right turn if you’re coming south from Duncan). Continue west along Mill Bay/Shawnigan Lake Road until you come to the Village of Shawnigan Lake and a stop sign at Renfrew Road. Turn right on Renfrew Road and follow Renfrew Road until you get to Gleneagles Road. Turn right on Gleneagles Road and continue until you to the parking lot for the Kinsol Trestle. From the parking lot it’s about a 1.5 kilometer walk on flat level ground to the Kinsol Trestle.